Frostgrave doesn’t use a lot of monsters, but it’s got a decent-sized bestiary. 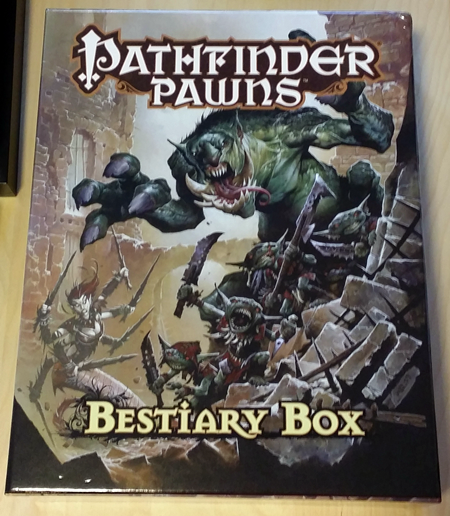 Since I’m using Pathfinder Pawns for my spellcasters and soldiers, I’m also using them for monsters — in the form of the Bestiary Box. There are 25 monsters in the Frostgrave bestiary. Most of the time, they’re encountered singly. 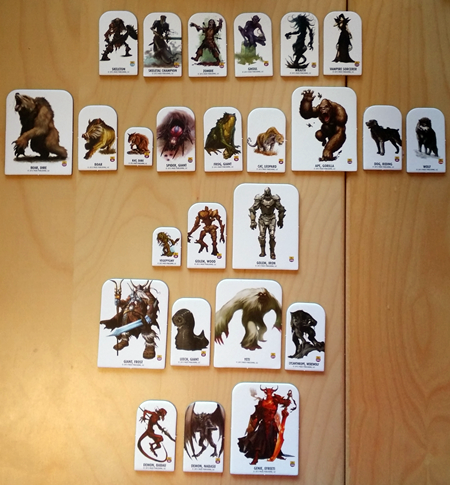 But of the 60 entries on the random encounter table, 15 (25%) are with 2, 3, or 4 of the same creature (most often 2). A couple of the scenarios in the core book also include multiples, though, so let’s see if we can account for those as well. One involves several skeletons, and the other could involve a few wraiths; in both cases, the number is variable, but low. Finally, there’s the one non-human soldier: the war dog. Since wild dogs are in the bestiary, if we have a dog we’ve got both covered — except that we could need several war dogs. There are over 300 pawns in the Bestiary Box, but Pathfinder has many, many more monsters than Frostgrave — all I care about is whether the subset I need, in the numbers I need, is represented in the box. 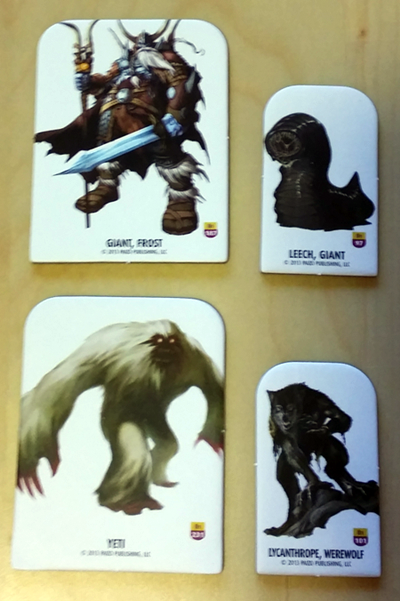 In the order they appear in the Frostgrave bestiary, here are all of the matching monsters from the Bestiary Box. 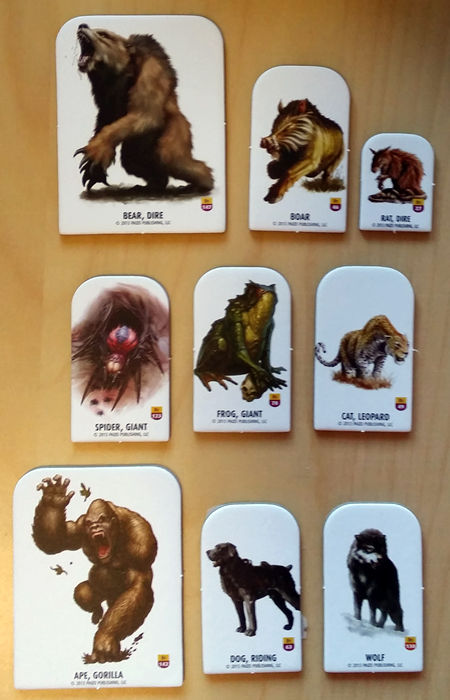 It’s a 1:1 match, with one exception: Frostgrave’s white gorillas aren’t large, but the only gorilla in the Bestiary Box is large. That’s not a big deal (hah!) to me, so in terms of having the right subset of monsters the Bestiary Box nails it. I made a couple of substitutions-in-name, but visually they match up well with what’s in Frostgrave. No ice toads, ice spiders, or snow leopards in Pathfinder, but those are pretty easy swaps. The riding dog is unfortunate, but the plain ol’ dog in the Bestiary Box is small, not medium. And of course there’s the Gorilla ProblemTM. I’d just swap in another non-large furry creature, or say gorillas in my Frostgrave are large, and call it a day. No small golems, but given that Frostgrave constructs can be made out of plants I kind of like the vegepygmy as my alternate. 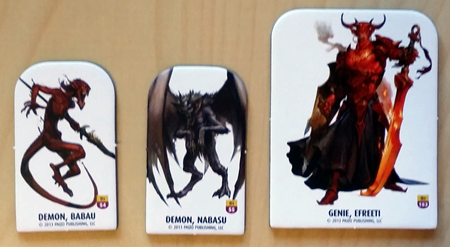 I love that Frostgrave demons can look like — and be — just about anything, and that means the Bestiary Box offers tons of options. Swapping in a leech for the worm seems legit, and I dig how well the Pathfinder yeti matches up with Frostgrave’s snow troll. Listed below are all the monsters you can encounter in groups, how many are needed, and then how many are in the Bestiary Box (in parentheses). 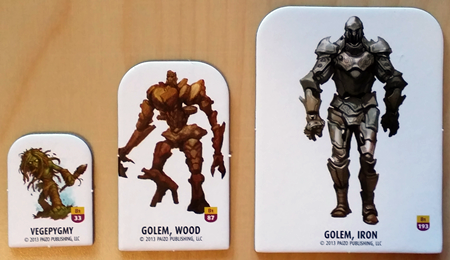 I’ve bolded the “problem” monsters. With the two scenarios (extra skeletons and wraiths), you’d have to rope in skeletal things to make up the difference in one, and add some ethereal undead (ghost, spectre, shadow) for the other. For war dogs, you’d need to mix in wolves if you have more than one on the table. Some corner cases could arise, too: You could roll up a random encounter with multiple monsters, then roll up the same encounter again while the first batch were still on the board. But on balance, the Bestiary Box comes really close to covering the multiples. All in all, I’m not too worried about making the odd substitution. Hell, I’m using pawns and prepainted terrain: absolute fidelity isn’t my top priority. Random encounters are statistically not that common, encounters with multiple monsters are even less common, and only half of those are actually a problem. I’ll take those odds. 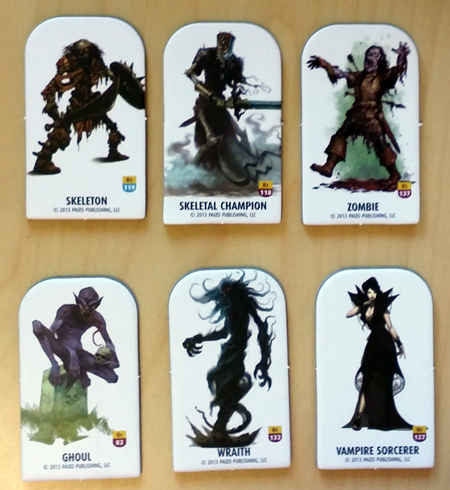 The Bestiary Box covers the Frostgrave monster list rather well — not perfectly, but more than close enough to keep me happy. So far, I’m liking the pawn approach.